Bowyer and managing director Derek Shaw are in India to discuss the strategy for the January transfer window. 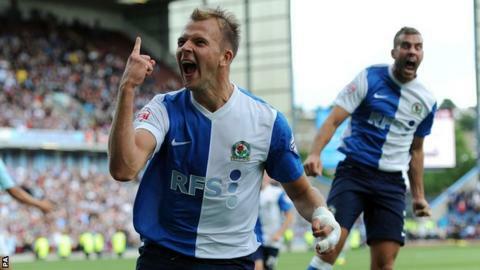 Scotland striker Rhodes, an £8m signing from Huddersfield in August 2012, has scored 10 goals this season for Rovers. "The owners have told us we don't have to sell Jordan Rhodes and he isn't for sale," said Bowyer. "We have had a meeting and it has gone well. The meeting has been planned for a while. "After the recent accounts, we have discussed the January transfer window and where we go from here. But they were firm that Rhodes is not for sale again, which is obviously great news for us." Jordan Rhodes has made 64 appearances for Blackburn since his £8m move from Huddersfield in August 2012, 62 of them starts, and has scored 38 goals. Bowyer and Shaw met co-owner Anuradha Desai in Pune on Monday and are due for more talks on Tuesday. Rhodes' future has been the with a number of clubs linked with a move for the 23-year-old, although no bid was lodged for him in the summer. And Rovers' owners remain determined to keep hold of their prized asset as they look to secure a return to the Premier League. on Saturday leaves Rovers 13th in the Championship and five points adrift of the play-off places. Shaw admitted earlier in November that their efforts to achieve promotion would be challenging after the club accounts showed the financial impact of relegation from the top flight in 2012. They revealed a £27.3m drop in turnover and a 136.1% wages-to-turnover ratio for the year ending June 2013. The accounts also showed Rovers' net debt had risen from £24.5m to £54.5m. Since dropping out of the Premier League in 2012, Blackburn have had four permanent managers. They finished 17th in the Championship last term.